Steve chats with the team at Equinox Software, which provides open source solutions to libraries around the world. Equinox was founded in 2007 by the original developers and designers of the Evergreen ILS. 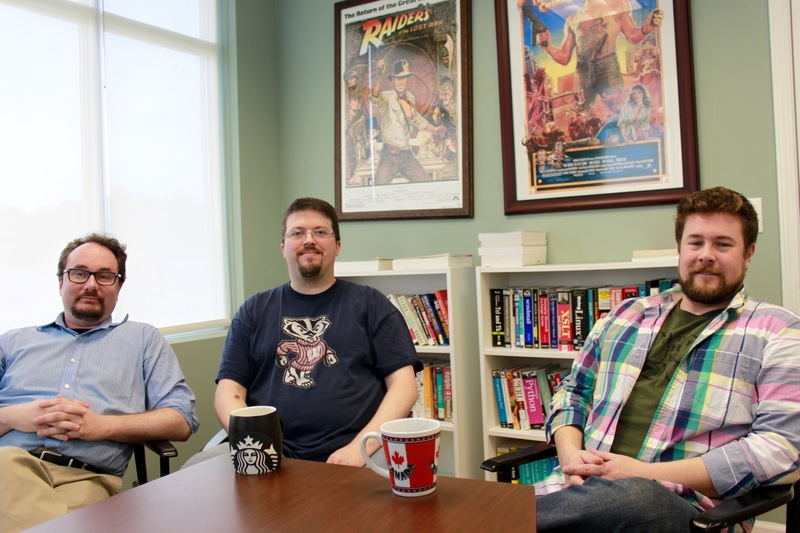 They are wholly devoted to the support and development of open source software in libraries, focusing on Evergreen, Koha, and the FulfILLment ILL system. Equinox is proud to be the only open source support company that can boast to employ both Evergreen and Koha core software developers. They wrote over 80% of the Evergreen code base and continue to contribute more new features, bug fixes, and documentation than any other organization. Mike Rylander was born in San Diego, but has lived in Georgia for over almost thirty years. Mike has held a wide variety of technical positions, but he started his career in the 90’s repairing SCO and AIX-based servers. From there he progressed into Linux support, to systems engineer, and finally to software development and DBA duties. In 2004, Mike was hired by the Georgia Public Library Service to help develop Evergreen. Mike’s role has always been one of designer and architect. In fact, the innovative OpenSRF infrastructure that lies underneath Evergreen was his brainchild. At Equinox, he leads all technical-leaning efforts including software development, systems engineering, and technical support. Mike loves explaining technical things to the non-technical, and solving problems. When not at work, Mike enjoys insanely hoppy beers, early 90’s indie rock, and Tae Kwon Do. Mike is married to his high school sweetheart and together they have two daughters. Jason Etheridge received his B.S. in Computer Science from the University of South Carolina and later joined the United States Army, ostensibly for military intelligence. He self-identifies as a software developer, though he wears many hats, and he is an open source and pro-commons advocate. He was instrumental in the development of Evergreen while working for PINES, and for its release under an open source license. Jason leans “paleo” and enjoys gaming of all sorts, but has a special fondness for pen & paper roleplaying games and juggling sticks. His favorite books include The Name of the Wind by Patrick Rothfuss and The Blade Itself by Joe Abercrombie. His favorite authors include Fred Saberhagen and David Brin. Galen Charlton is a library hacker who has been working in library automation and data-slinging for the past 15 years, helping migrate hundreds of libraries to new ILSs and digital library systems. In the process, he has worked with the full gamut of library types and sizes, including small church libraries, public and academic libraries of all sizes, library consortia, and national libraries. In recent years, Galen joined the world of library open source software, contributing to both Koha and Evergreen as well as other F/LOSS projects. He was elected release manager for versions 3.2 and 3.14 of Koha. Galen was named a Library Journal Mover and Shaker in 2013. When not staring firmly at code and data to scare the bugs and inconsistencies away, he, along with his wife Marlene, is a loyal servant to three cats.